Kassie Forro submitted this photo and caption. This past summer I toured with the Troopers as a volunteer. I live in Brisbane, Australia and before this season, I had never experienced drum corps in any way shape or form, I can definitely now say that I am a fan. 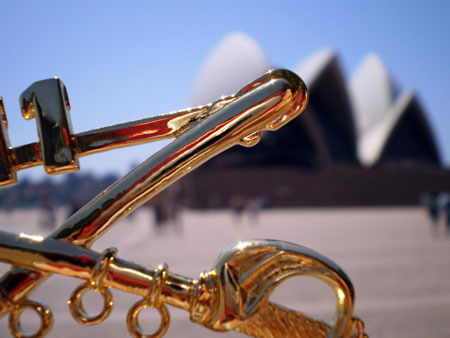 This is a photo I took of the Troopers "crossed sabers" in front of the Sydney Opera House. I'm in the process of trying to save up to see the Troopers play at the World Championships next year! Go Troop!